BRAMMO, an Oregon company which builds the first mass-market electric motorcycle, was featured on CNBC yesterday morning. Best Buy has invested in the company and is selling the bike in some West Coast stores, with a rollout to the rest of the country to follow. Retail price is $12000, but the machine is eligible for a 10% federal income tax credit for plug-in vehicles; operating costs are about 1¢ per mile for electricity. The state of Oregon also offers a residential electric tax credit of $1500. The Consumer Reports blog was favorably impressed in a June review. See here for other seasonal forecasts, including the current NOAA winter forecast. The federal government's Energy Information Agency (EIA) today issued its winter forecast (Oct. 1, 2009 to March 31, 2010). The outlook calls for a national average decrease in home heating expenses of 8% from last year. The decrease is mainly the result of lower fuel prices, but milder temperatures are also a factor. 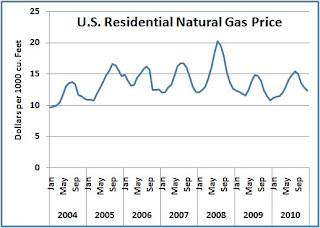 The largest reductions are for households using natural gas (down 12%) and propane (down 14%). Costs for electricity and heating oil are projected to decline by 2%. NOAA's latest experimental monthly degree day forecast shows that the contiguous 48 states are likely to be 1% warmer than average. Degree day predictions vary between regions, with the Midwest forecast to be 4% warmer and the West 4% colder. New England and the Mid Atlantic regions are forecast to be near normal. The South Atlantic area, which includes DC, Maryland, and Virginia southward through the Carolinas to Florida, is predicted to be 2-3% colder on average. Maryland and Virginia, however, are each expected to be within 1 heating degree day of normal per month.